The City of Twentynine Palms, California, in the southern Mojave Desert, is the home of Joshua Tree National Park headquarters and north entrance and is a gateway to Mojave National Preserve. In 2018, the city partnered with the Bureau of Land Management to also become the officially designated Gateway to the new Mojave Trails National Monument. Spanning 1.6 million acres, more than 350,000 acres of previously Congressionally-designated Wilderness, the Mojave Trails National Monument is comprised of a stunning mosaic of rugged mountain ranges, ancient lava flows, and spectacular sand dunes. 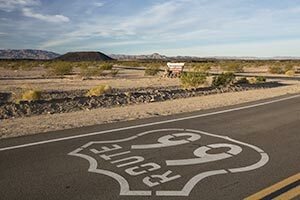 The monument protects irreplaceable historic resources including ancient Native American trading routes, World War II-era training camps, and the longest remaining undeveloped stretch of Route 66. Additionally, the area has been a focus of study and research for decades, including geological research and ecological studies on the effects of climate change and land management practices on ecological communities and wildlife. 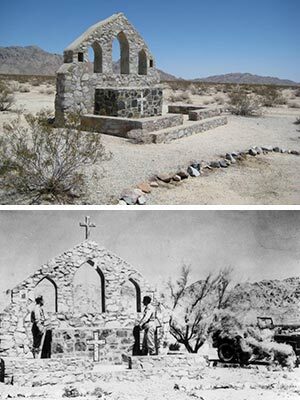 Discover the new Mojave Trails National Monument, designated February 12, 2016. 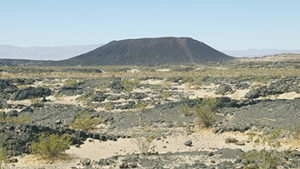 Amboy Crater National Natural Landmark is a 10,000-year-old volcano and adjacent lava flows, located next to Route 66 in the Mojave Trails National Monument. 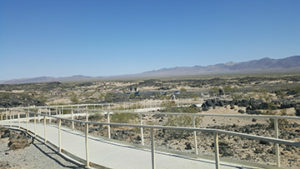 Day use area includes shade ramadas, picnic tables, vault toilet restrooms, paved road and parking lot, interpretive kiosk and scenic observation point. A 1.5 mile hiking trail to the volcano is accessible from the parking lot, although due to extreme heat the basaltic rock reflects, it is recommended to hike only in the months between October and April, and to always carry plenty of water.